Junior Riley Stockton scored 15 points to help lift Seattle Pacific over Western Oregon 79–47 at Homecoming, Saturday, February 1. Very rarely does a visiting basketball team win a game at Western Washington. 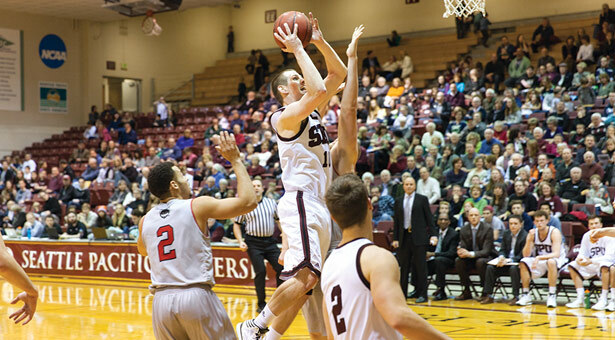 The Seattle Pacific University men were that rare exception on January 15, 2014, leading for all but the opening moments of the ROOT Sports-televised game on the way to a 76–60 victory. The Falcons thus snapped the Vikings’ 36-game homecourt winning streak. Along with a sweep of the Alaska schools and victories at Simon Fraser and Montana State Billings, the SPU men were very much back in the national picture, making a return to the top 25 rankings. The 92–87 double-overtime win at Billings on January 25 closed out the first half of Great Northwest Athletic Conference play. The Falcon women’s basketball team also was back in a winning groove, starting with a 63–57 home victory against GNAC preseason favorite Montana State Billings on January 11. SPU finished the first half of the conference schedule on a five-game winning streak, capped by a 78–68 victory against Saint Martin’s in which the women came back from a 14-point deficit. Seattle Pacific’s gymnasts picked up where they left off in 2013, topping 190 points in their first three meets. The Falcons came within half a point of the crosstown rival Washington Huskies on January 24, scoring 193.425 points, the seventh-highest score in school history. As the season moves into the early spring, SPU will be taking aim at its 32nd trip in 33 years to the national championships. The Falcons had a handful of top-10 finishers at the season-opening UW Indoor Preview track and field meet on January 18. Their sights are set on the GNAC Championships on February 21 and 22 in Nampa, Idaho. The track teams will be hoping to duplicate the success the women’s cross country team enjoyed in November. Seattle Pacific, led by McKayla Fricker and Anna Patti, finished fourth at the NCAA West Regionals, and 21st at the Division II nationals, both in Spokane. A GNAC Tournament title and an 11th straight NCAA appearance capped another successful women’s soccer season for coach Chuck Sekyra and his team in the fall. The men’s soccer team, guided by coach Mark Collings, made the NCAAs for the third consecutive season.